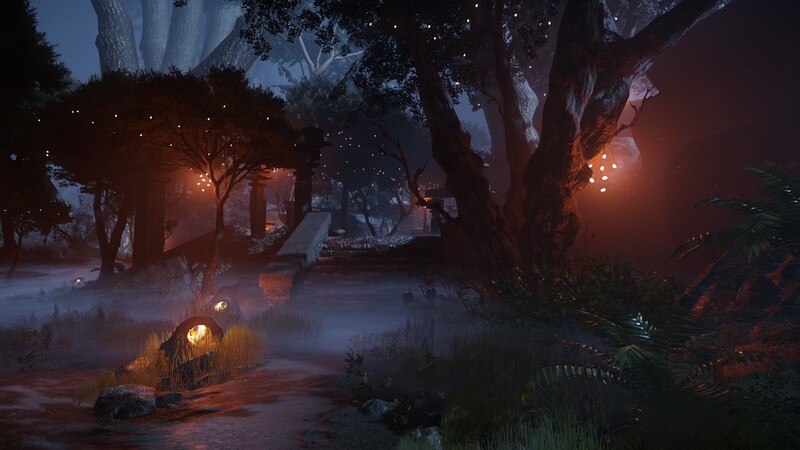 I first encountered Aporia: Beyond the Valley in 2015 as a free-to-play alpha demo. 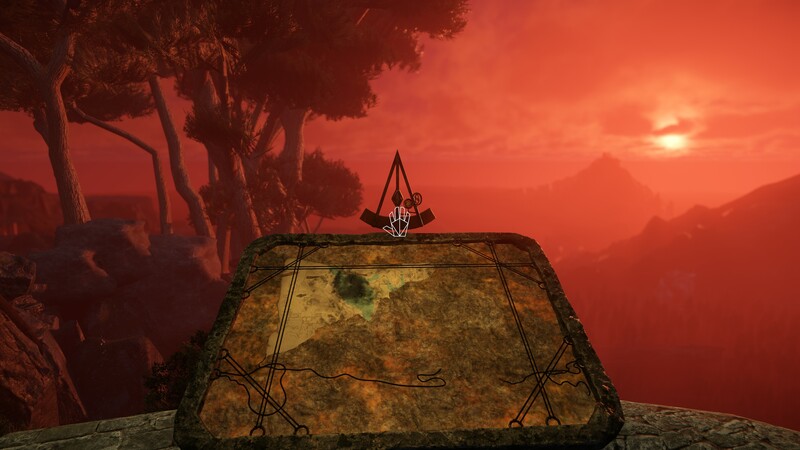 At the time, I was looking for some fun adventure and puzzle games, similar to those in the Myst franchise, and the game’s unique style drew me in. The game’s developer was very kind and worked with me to make my way through as much of the demo as I could and, even though it was a bit rough around the edges, I was looking forward to seeing where the game would eventually go. It was nearly two years later that I heard anything more about this little gem. This past July, I happened to notice that the game was heading to Steam and I was quite surprised. I dug out the old email thread I had with the developer and got back in touch, and they were very kind to provide me with a review code for the full version of the game. 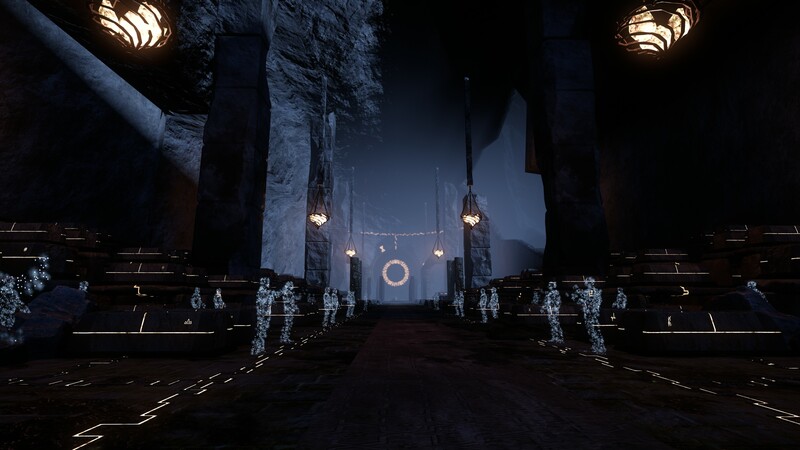 One of the most unique things about Aporia is that it’s a game with a compelling narrative, yet one completely free of dialogue of any kind. 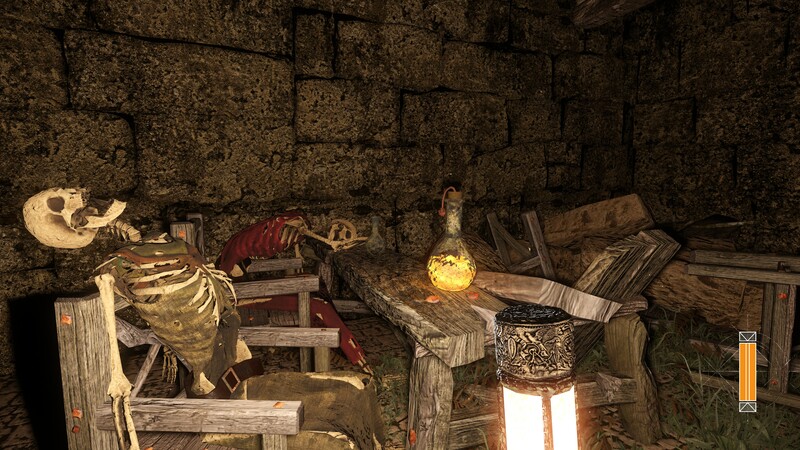 When you start a new game, you awaken from what appears to be suspended animation in a large cave-like chamber, and you seem to be quite alone. In front of you is a glowing cylinder on a large platform that’s begging you to pick it up. While in this large cavernous space, you see five other suspension devices, some long empty and another that appears still occupied, though it’s partially covered by large debris and tapestries. It contains a pedestal that you can fit your newly-found glowing cylinder into. Doing so activates a holographic stop-motion animated sequence that gives you a bit of backstory on the cylinder you now possess, showing its creation by a shaman as well as a group of people who were sealed in this chamber at some later point. If you pay attention closely to these individuals, and compare their dress to the symbols in the room, you can figure out not only who was within each of the chambers in the room, but also who you’re most likely playing as. 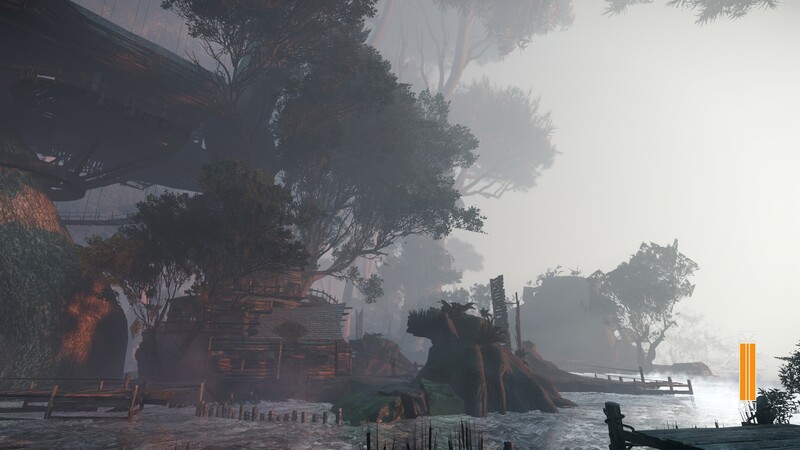 What you encounter in the first few minutes of the game demonstrates how the storyline will be delivered throughout the rest of your adventure. As you make your way out of the chamber, down the winding cliffside paths, and eventually into the titular valley itself, you’ll encounter various tapestries that relay pieces of the inhabitants’ past. Sometimes these are just benign bits of information, or perhaps a small story that serves as a warning about a certain environmental hazard (such as one group of tapestries that shows the drowning of a fisherman, which warns you about the strong currents in the nearby river), but others warn you about more ominous threats. You will also find more pedestals that you can insert your cylinder into, playing more stop-motion animation sequences that will continue to shed more light on the larger history of the valley and the individuals who lead it (including yourself). The cylinder you possess ends up being a key component to exploring the valley and unlocking its secrets. 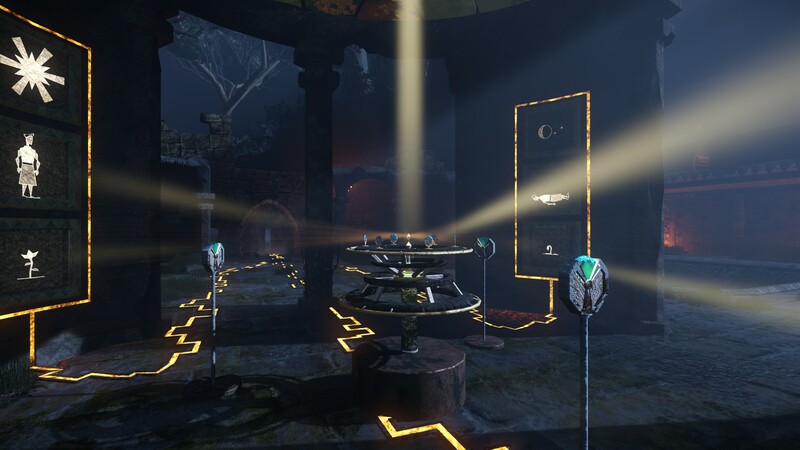 In the chamber you awaken in, you’re shown how you can use the cylinder in certain types of pedestals to drain a bit of its glowing essence and direct it to power objects or open locked doors. Sometimes you’ll have to direct energy through multiple pedestals in an energy relay of sorts, or use multiple pedestals to power a single doorway. However, each time you use the cylinder to do a task like this, it will drain a bit of its power. Once the cylinder is empty, you won’t be able to use it until you replenish its resources. Thankfully this isn’t too difficult in most cases (unless you went out of your way to waste its power), because you can find jugs containing the glowing liquid you’ll need scattered around the environment. Each jug fills about a quarter of the cylinder’s energy, so you’ll want to make judicious use of your resources. As you press on further along your adventure, you’ll also discover a few other uses for your device. For starters, if you take it out while in a dark area, such as a building or cave, the glowing liquid will serve as a flashlight for you. The light from the cylinder can also cause special flowers to bloom on demand, and consuming them will replenish some of your health. 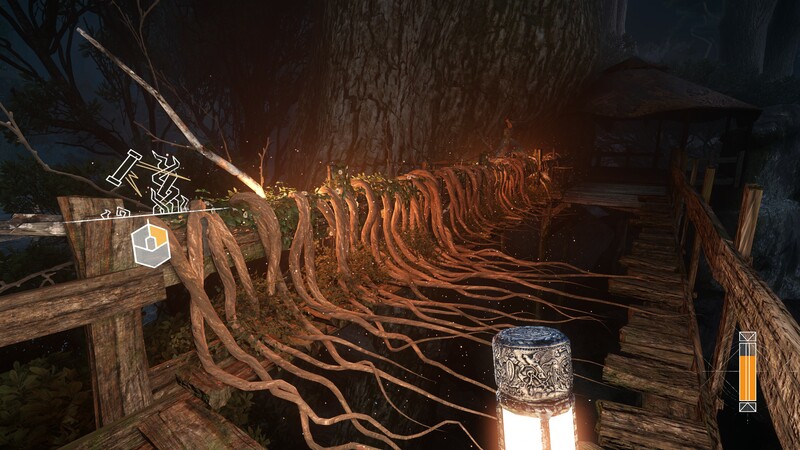 You’ll also be able to use it to cause other types of plants to grow, creating bridges and ladders out of vines that will allow you to access areas you previously couldn’t. 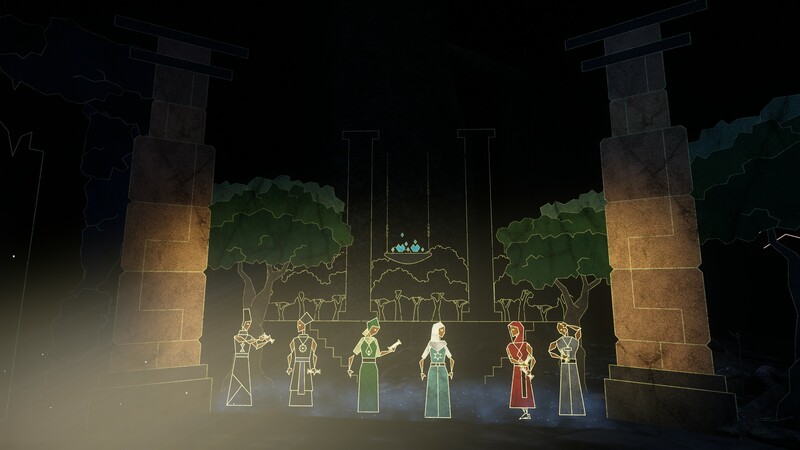 Although the game focuses a great deal on exploration in your journey to uncover the mystery of what happened to the great civilization that once inhabited the valley, it also presents you with various puzzles that you need to solve along the way. While these do take a good deal of thought to figure out, most of the time the methodology behind them makes sense and the puzzles don’t feel unfair. In this regard, the developer seems to have struck a solid balance between difficulty and fun. Also, as you make your way into the main valley itself, you’ll begin to encounter a supernatural, shadow-like entity whose existence was hinted at in various tapestries you previously encountered. Being in its presence will begin to slowly drain away your health, so you’ll want to shine your cylinder at it to make it leave you alone or quickly get away from it. Because you’ve been allowed to explore unimpeded prior to this point, the entity’s presence is alarming. Thankfully, its menace is at first merely startling, then annoying, and it won’t pose much of a threat to you until you’re a bit further along in your journey. Visually, Aporia is a pretty impressive experience. 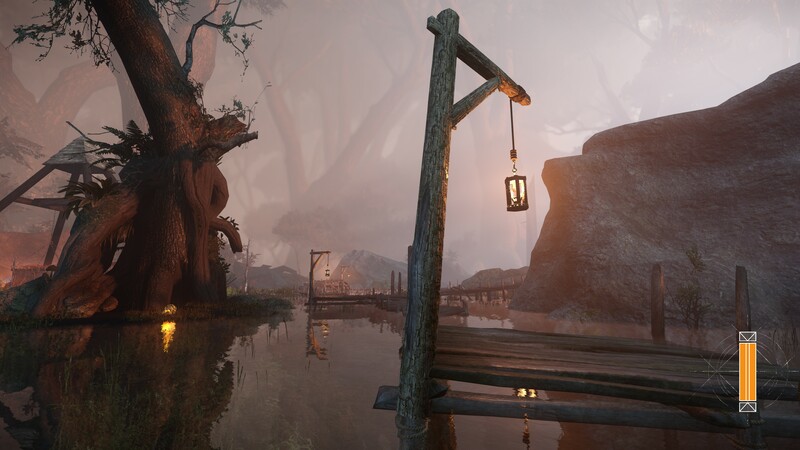 The environments are well-detailed and feel very much alive, and the environmental effects like low-lying fog are done well. The game also does a great job with its lighting effects. Everything looks fantastic while playing on a large 4K HDR display, and the game is incredibly immersive. Unfortunately, despite all of this, there are a few graphical bugs that I encountered during my exploration. In a few spots, when taking a closer look at the ground, it’s quite apparent that the grass, weeds, and pebbles are actually being rendered floating slightly above the actual terrain. The lighting also acts strangely when you transition between an exterior area and an interior one or vice-versa. The way water flows across the environment can appear awkward in a few spots, and in a couple areas the water textures appear glitchy. There were also a couple instances of environmental objects not rendering correctly when loading a save file. 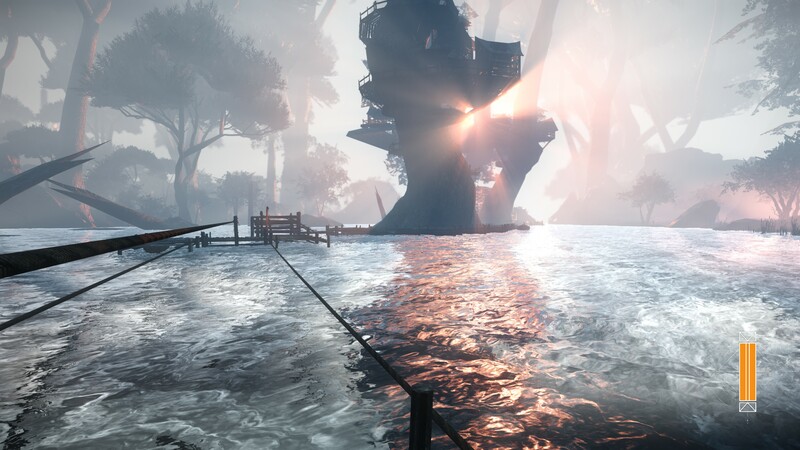 However, rather than existing as invisible textures, these objects didn’t load in at all, meaning that where a bridge or dock should have existed, there was nothing. The only way to force them to load in was to walk far enough away for them to debuffer and then return, hoping they spawned correctly that time. This was particularly unfortunate when the game had been saved while standing on one of these objects, causing me to immediately fall into the rushing river below when loading my save file. Jumping into the river caused me to get dragged along a bit until I got stuck on the environment. At this point, I wasn’t drowning, but I was also unable to get away from the strong currents. Eventually, I managed to do some tricky maneuvers and break free, but had I been unable to do so I would have had no choice but to reload a previous save file. There was also one instance where the game completely froze up on me, and I couldn’t figure out exactly what caused this to happen. 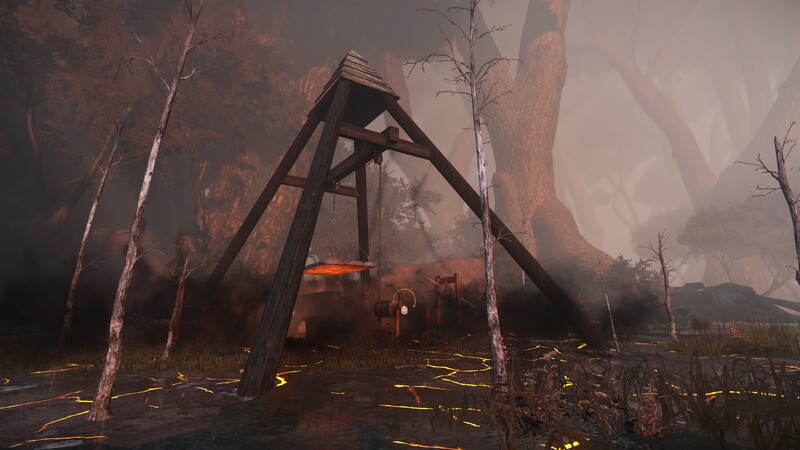 Ultimately, I feel like Aporia: Beyond the Valley is a mysterious, intriguing, and beautifully-puzzling adventure game that will draw people in with its unique story and presentation. There’s a lot to love with this one, even if it’s true that the game could have used a bit more polish before being released. 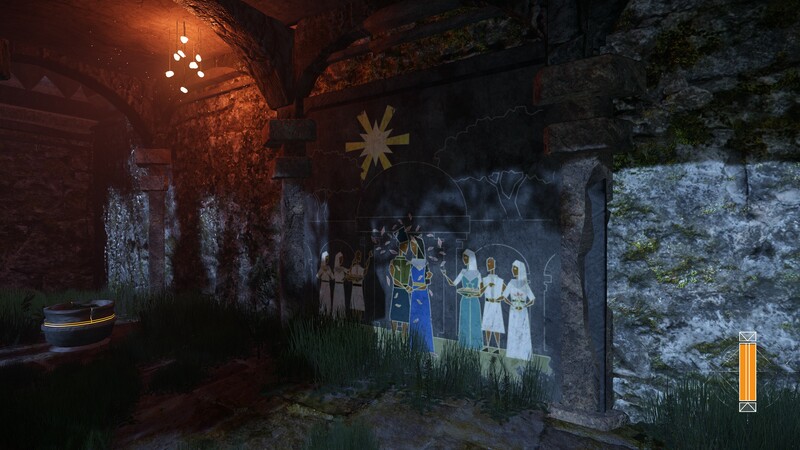 I feel like Aporia is a very good game in its current form, but with a bit more work it could have been an excellent game. Still, the core beauty of the game and the world it presents manages to shine through, keeping any one individual bug from marring an otherwise lovely experience. 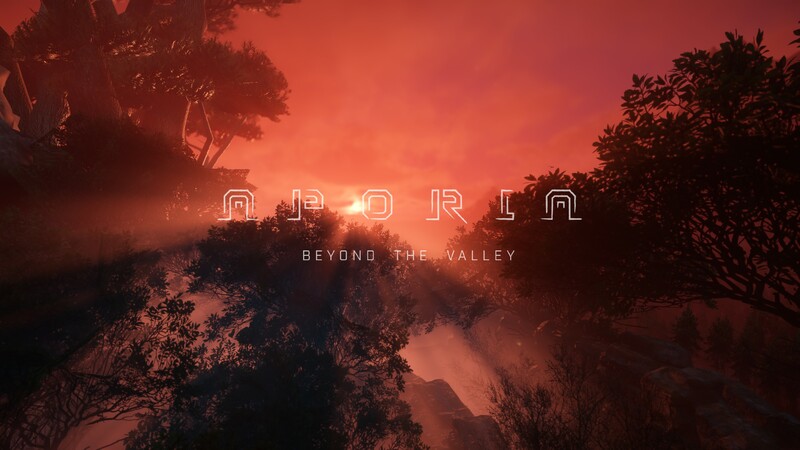 Aporia: Beyond the Valley is a solid adventure that would make an excellent addition to any PC gamer’s library, particularly if they enjoy Myst-like experiences!